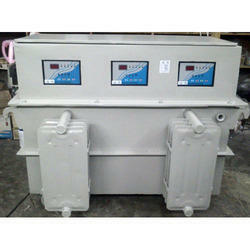 Manufacturer & Exporter of Servo Voltage Stabilizers. Our product range also comprises of Electric Dynamo Meter, Electric Drive System, and Hydraulic Sensor. A Servo Voltage Stabilizer (SVS) is a regulator designed to automatically maintain constant voltage level. In most industries, a minor fluctuation in voltage can cause the connected equipment to malfunction or breakdown. The basic use of SVS is to control fluctuation and to provide a constant output Voltage with +/- 1% accuracy.